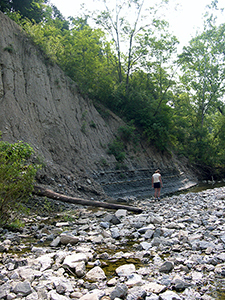 If you hike along Collins' Run in Peffer Park (in Miami's Natural Areas) you can observe many geologic features, common in southwestern Ohio. 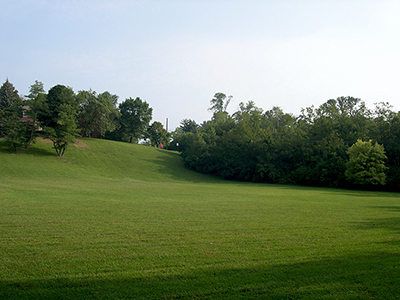 The wide, gently sloping valley in Peffer Park was created during the Pleistocene Epoch. 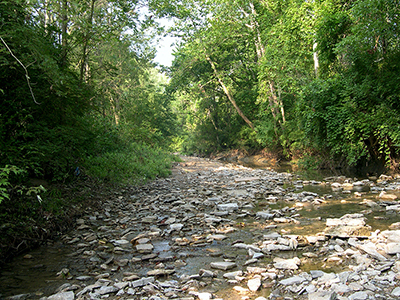 Now, a fairly small creek, called Collins' Run, resides in this valley. Looking up the stream bed from the footbridge, the stream channel contains abundant rocks. A closer look at the rocks shows that they are imbricated (or slanting) in the up-current direction. This configuration is the most stable one for flat rocks in a stream bed. 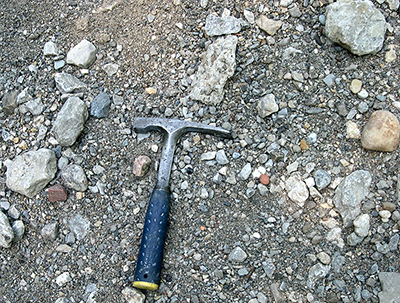 Imbricated to jumbled gravel and larger clasts rest atop glacial till. 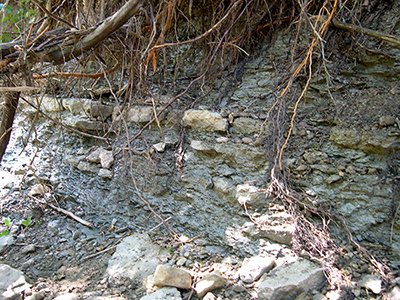 These deposits are identical to modern stream deposits and represent a former channel of Collins' Run Creek. 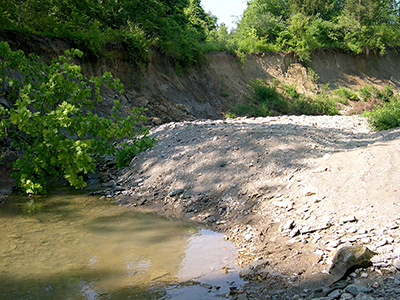 If you look downstream along the cut bank, you will see that the glacial till forms a steep bank. 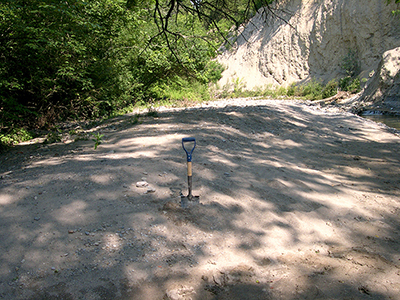 You should be able to pick out point bars of sand and gravel (foreground) and a cut bank of glacial till (background). 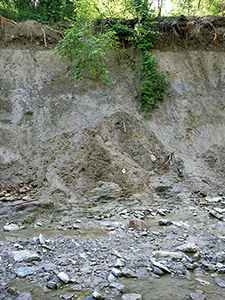 Point bars in this stream are composed of fairly typical sediments, namely sand and gravel. 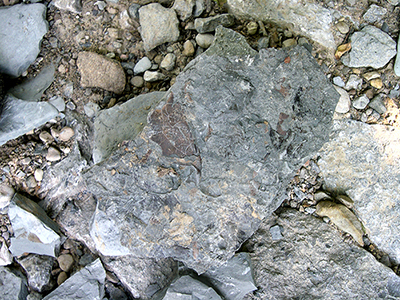 Larger fragments of limestone and weathered shale are common, as are individual fossils weathered out of their enclosing rocks. 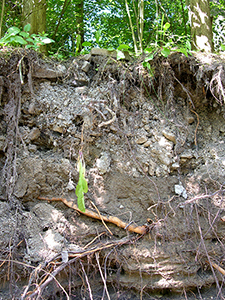 A close-up view of the cut bank shows soil horizons at its top and a weathered slump block at its base. 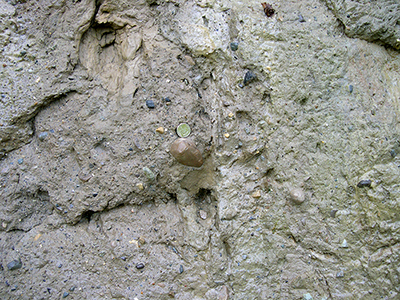 An even closer view of the cut bank shows the typical, unsorted clay-to-cobble-sized sediments in the till. 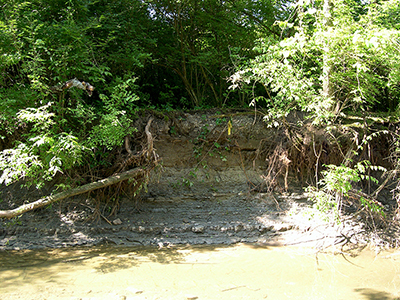 The ovoid mass of glacial till weathered out of the cut bank and fell into the stream. 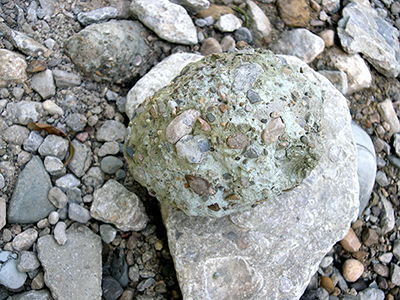 A slightly smaller "ball" of till was shaped by its journey down the stream bed, during which time it became armored by picking up several small rocks. 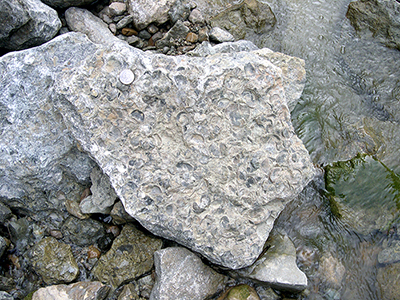 Fossiliferous limestone is representative of the local limestone bedrock. 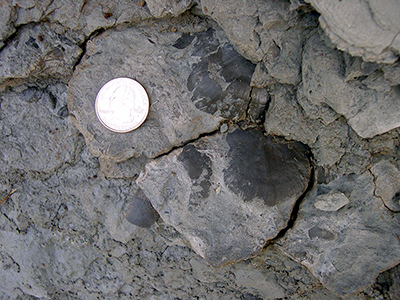 This particular bedrock contains numerous brachiopod fossils. 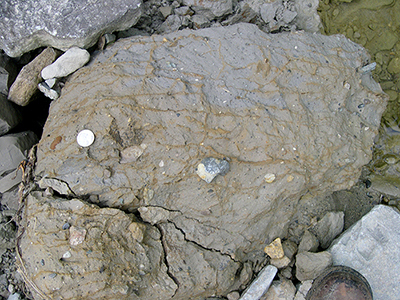 Other rocks, usually the rounder ones without fossils, did not originate from the local bedrock. Instead, glaciers transported these rocks, called glacial erratics, from places far to the north, such as Canada. 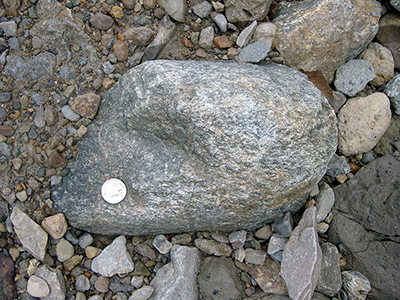 In some places, you can even see glacial till sitting directly on top of bedrock. Such places clearly show the "gap" in time, or unconformity, between the deposition of the bedrock (450 million years ago) and the till (24,000 years ago). A little farther up Collins' Run, you will see bedrock exposed in the stream bank. This bedrock, composed of flat-lying limestone and shale (or mudstone), is about 450 million years old. 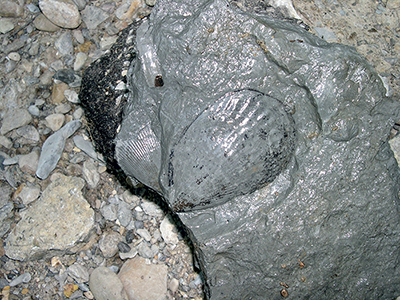 The presence of fossils of marine creatures in the local bedrock indicates that the original sediments were deposited in a warm, shallow sea. About 450 million years ago, such a sea covered much of North America, and Ohio was south of the equator. 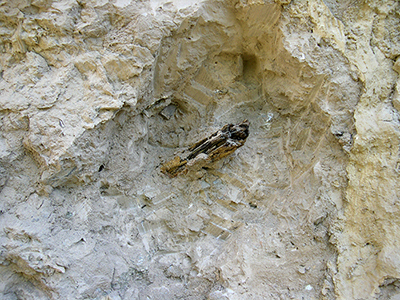 Not all fossils are shells or bones. 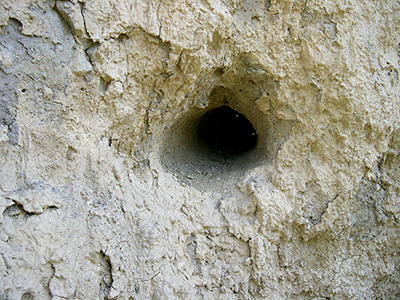 Sometimes fossils are other materials that contain or reveal the tracks and other traces of animal activity. 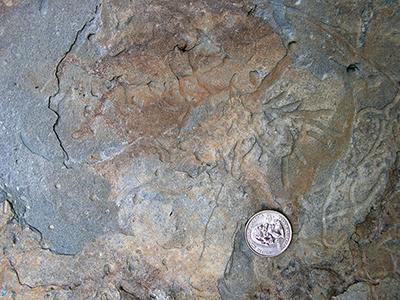 For example, the tracks of feeding marks left by marine worms are very common in local bedrock. 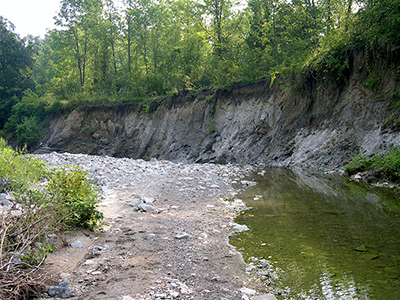 The "Bluffs" area is a high-cut bank that exposes about ten meters of till overlying a few meters of limestone and shale bedrock layers. If you look closely at the glacial till, you can see pieces of the Pleistocene (Ice-Age) wood that were incorporated into the till as the glacier rode over the landscape. By using radiocarbon methods, geologists have been able to trace the date of this wood. They estimate this wood to be approximately 24,000 years old; this means that the till that encloses it is at least that old. 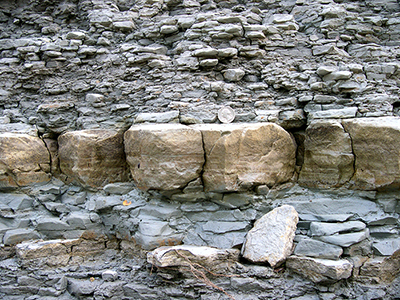 In the Waynesville Formation, the limestone appears light colored and blocky, and the shale appears blue-gray and crumbly. 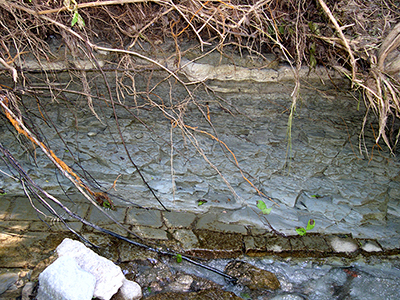 A closer view shows two thin beds of limestone enclosed within shale. Branches of what were probably spruce trees were overriden by the advancing glaciers during the latest glacial advance. 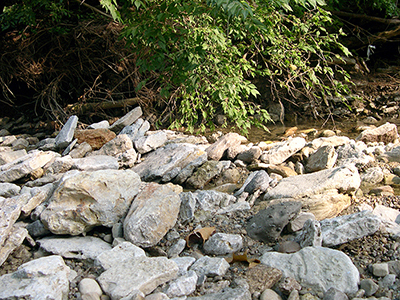 A boulder that originated from either Canada or Michigan can be seen near the creek. 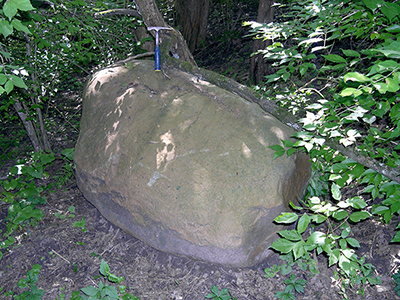 Glacial ice carried this boulder for hundreds of miles, depositing it here in Ohio. 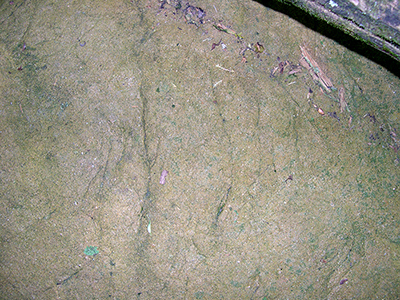 A close-up of the boulder's surface reveals curved cracks called chatter marks. These marks were caused by the boulder being dragged across solid rock during transport.